Photo 1: Karun 3 Dam Bridge, Iran . ( Source: Tarishaanzan). The average annual precipitation is estimated at 250mm, varying from 50mm in parts of the central water basin, to more than 1,600mm in some coastal areas near the Caspian Sea. The global average annual precipitation is more than 830mm, classifying Iran as arid and semi-arid. In the last 50 years, Iran has faced ten periods of severe drought. The most recent was between 2001-2004, which significantly threatened water availability in all sectors. It is expected that climate change will further increase the risk of droughts in some parts of the country while causing floods in other parts. Since 2015, the frequency of floods has considerably increased. The largest flood in Iran’s recent history occurred in April 2016, when the Karun River in the south-west province of Khouzestan burst its banks. Of the average annual rainfall volume of 400 billion cubic metres (BCM), an estimated 68% evaporates before reaching the rivers. The total long-term annual renewable water resources are estimated at 120BCM, of which about 78BCM go to surface run-off. 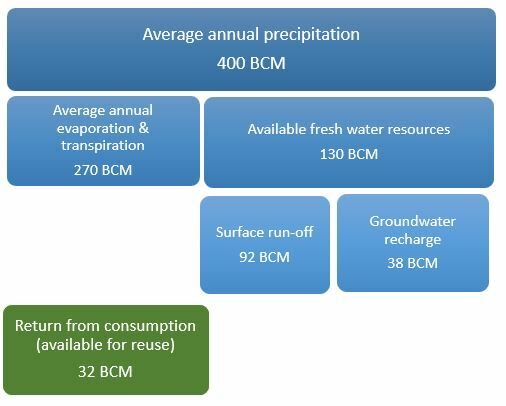 And groundwater recharge is estimated at about 42BCM per annum, 11BCM by qanats (underground water supply systems) and springs, plus 31BCM by wells. The available per capita water is around 1,500m3, which is considerably less than the 7,000m3 per capita available in 1956. 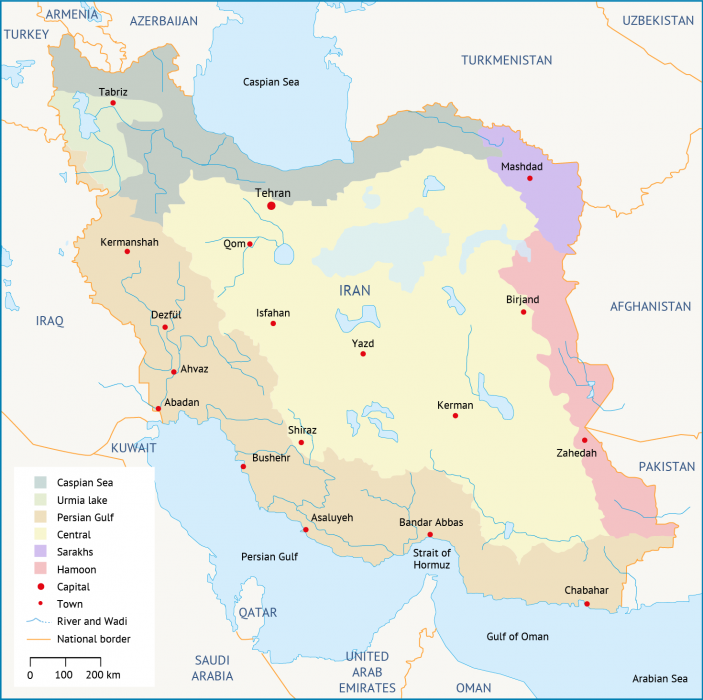 Iran is divided into six main and 31 secondary catchment areas. The six major basins are: the Central Plateau (Markazi) in the middle of the country (831,000km2), the Lake Urmia basin in the north-west (53,000km2), the Persian Gulf and the Gulf of Oman basin in the west and south (430,000km2), the Lake Hamoon basin in the east (Mashkil Hirmand, 106,000km2), the Kara-Kum basin (Sarakhs) in the north-east (44,000 km2), and the Caspian Sea basin in the north (Khazar, 170,000km2) (Map 1). All these basins, except the Persian Gulf and the Gulf of Oman basin, are interior basins. Almost half of the country’s renewable water resources; are located in the Persian Gulf and the Gulf of Oman basin, which covers a fourth of the country. By comparison, less than a third of the total renewable water resources are located in the Markazi basin, which covers over half of the country. With an area of 424,240km2, the Caspian Sea is the largest landlocked water body in the world and lies about 22 metres below sea level. Map 1. Iran’s major basins. In 2001, there were 39 wastewater treatment plants with a total capacity of 712,000m3/day, treating the wastewater produced by a population of 3.8 million. The wastewater actually treated was around 130 million m3/year. Some 79 treatment plants with a total capacity of 1.917 million m3/day, were under construction and 112 treatment plants with a total capacity of 1.590 million m3/day were being studied for completion by 2010. At present, more than 96% of Iranian cities have access to a safe water supply system. Water pollution is often due to a lack of sanitary collection and disposal of solid waste, urban and industrial wastewater (including all kinds of pollutants), pesticides and chemical agricultural substances. These pollutants consist of several kinds of disease factors, and harmful mineral and organic materials, the identification, separation and treatment of which is difficult and expensive. Fahmi, H., 2012. An Overview of Water Resources Management in the IR of Iran. Ministry of Energy of Iran. Deputy Minister of Energy, 14 April 2016. Press release. Available at alef.ir/vdcc1pq1o2bq0s8.ala2.html?345139. United Nations, 2004. Freshwater and Sanitation Country Profile. Available at www.un.org/esa/agenda21/natlinfo/countr/iran/Iranwatersanitf.pdf. Fahmi, H., 2012. An Overview of Water Resources Management in the IR of Iran, Ministry of Energy of Iran.